Elevated between 2001 ft and 7218 ft, the Ski Resort is among the 10 highest elevated Ski Resorts in Carinthia. The vertical drop from summit to base is 5217 ft. The average difference in altitude between base and summit of Ski Resorts in Austria is 2392 ft. Most runs are therefore relatively long. Nassfeld Hermagor is among the 10 best rated Ski Resorts in Carinthia. It is among the 10 most family-friendly ski Resorts in Carinthia. Average snow depth during the season (Dec 7 to Apr 22) is 45 " at summit elevation and 10 " at base elevation. Snow coverage is usually best during March, offering an average snow depth of 65 " at summit elevation and 11 " at the base. Therefore Nassfeld Hermagor is among the 10 ski Resorts with best snow conditions in Carinthia. Nassfeld Hermagor features 78 sunny days on average per season. The average for all ski Resorts in Austria is 62 sunny days. February is the sunniest month with an average of 22 sunny days. 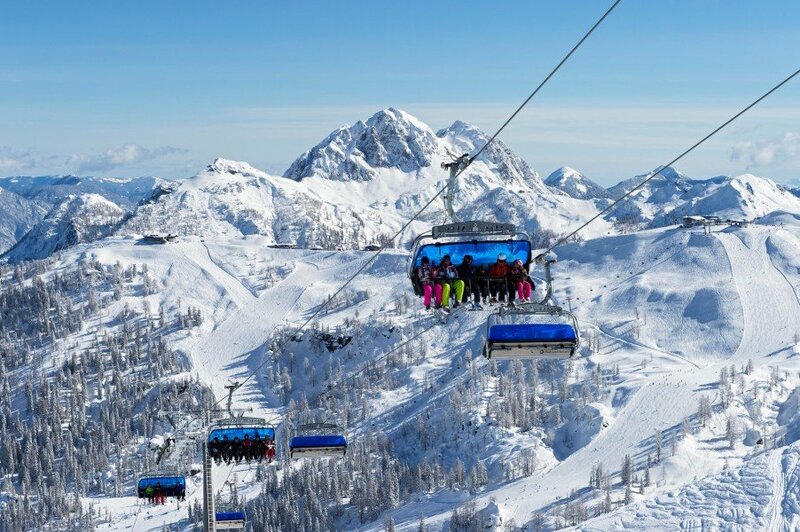 Offering 68 miles of slopes and terrain, Nassfeld Hermagor is the largest ski resort in Carinthia. 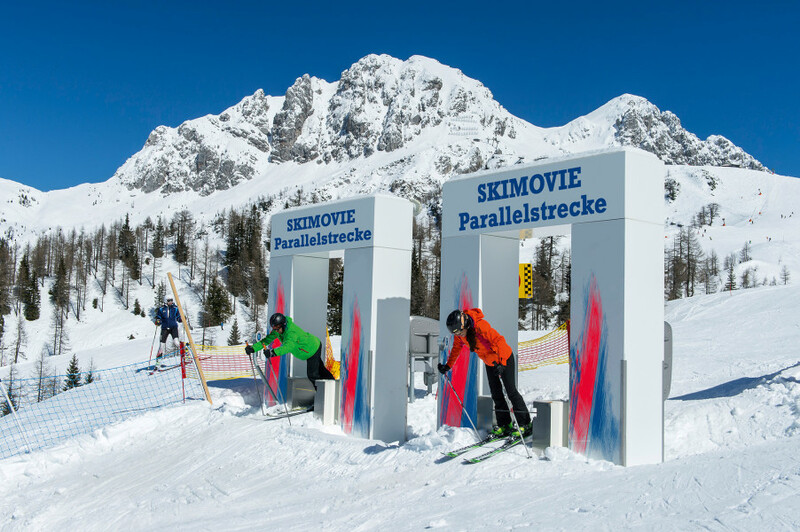 The ski resort Nassfeld with its 110 kilometers of piste has everything the heart of winter sport fans desires. With 69 red marked slopes especially advanced skiers have a great selection of slopes. With 30 kilometers (18.6 mi) of blue marked trails and eleven kilometers (6.8 mi) of black marked pistes there is also enough terrain for beginners and experts. 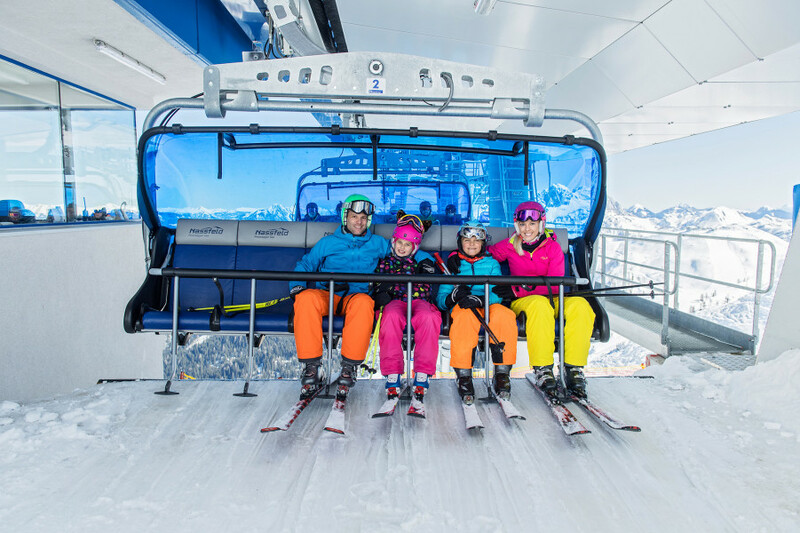 In addition Nassfeld just added the longest gondola lift of the Alps to their resort – the Millennium-Express. For the little skiers Nassfeld has a number of ski school practice grounds and children's areas for those first attempts. BOBO's Mini Club “All-in-one” at the Tressdorfer Alm is a kindergarten for children aged three and older. Professional staff will take good care of your little ones while you discover the ski resort of Nassfeld on your own. At the Gartnerkofel snowboarders will find a cool and exciting terrain park with a fun-cross track waiting for them. Moreover there is a rails section with a Beginners Line, Jib Line and Pro Line. On Sundays there are snowboard and freeski workshops. The best part is you don't even need to sign up – just stop by and join in on the fun! Freeriders have their own separate terrain with special marked freeride areas in the so-called “Schneeloch” of Nassfeld. Here you'll find one of a kind deep snow hills with great powder snow. For ski touring fans there are many different tours with varying levels of difficulty for you to try. The challenging Rosskofel-Tour for example starts at the foot of the mountain Rosskofel. You can reach the starting point via the Millennium-Express. The rest of the tour will lead you past the rock massif of the Rosskofel which is a magnificent view and definitely worth seeing. Need a quick break from the glorious winter sport? There are 25 wonderful mountain huts at your disposal in Nassfeld. A cozy lunch break at the Tressdorfer Alm is definitely worth stopping by and with its central location close to the intermediate station of the Millennium-Express it is easy to reach as well. This place is perfect for sitting outside on the sun terrace and enjoying delicious Italian pizza with a stunning view. 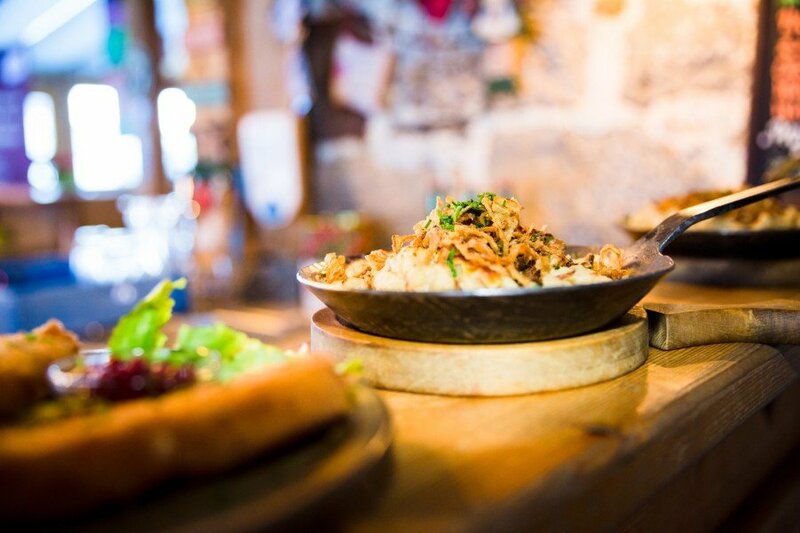 Later on, the Tressdorfer Alm turns into the perfect Après-Ski spot with great food, trendy music and cool party atmosphere. In the bar “zum Euter” you can enjoy delicious Glühwein, try some tasty Jagatee as well as listen to the most popular Après Ski hit songs. The ski resort Nassfeld has the longest slope illuminated by floodlights in the entire Alps! On the 2.2 kilometers (1.3 mi) long slope called “Bunte Piste” you can continue skiing even after the sun has set. An additional incentive for trying night skiing would be the so-called “Schmankerlgondel”(translates to 'delicacy gondola'). The fun begins at the base station of the Millennium-Express. The gondola changes from means of transportation to a tiny restaurant! You get to taste regional specialties and scrumptious snacks while going up the mountain. Just order your favorites beforehand and when you reach the station, your private gondola restaurant will be waiting for you (22 USD/15 GBP pp). This is a fun experience for everyone and definitely recommended when visiting Hermagor. In addition the ski resort has the 7.6 kilometers (4.7 mi) long run to the valley called Carnia. This slope leads all the way back to the community Tröpolach and is the longest run in the ski resort. The most challenging slope in the resort would be the Trogkofelabfahrt with a length of two kilometers (1.2 mi) and a difference in altitude of 600 meters (1968.5 mi). At the slope No. 70 called Schnittlauchkofel you'll find a speed measuring track. At the piste called Zweikofelabfahrt, a public racing track with time and video recording awaits you. These recordings are a great holiday souvenir to share with friends and family. The second SkiMovie racing track at the slope Watschiger Alm-Abfahrt has enough space for two people to speed down the giant slalom simultaneously. Challenge a friend or family member to the major showdown of your skiing skills! Funslope Nassfeld - Give me five! At the NTC Blue Day Sports and Funpark you can rent awesome sports equipment such as Tubes, Snowbikes, Skifox, Zipfl Bob (for bobsledding), Snowskates, Snowscooters, Snow Trikkes, Bike Boards or Hamax Snowsurfers. The area provides much practice terrain to get used to different ways of getting around the mountain. The area “Funbox” is also perfect for trying out the sports equipment and is located just behind the base station of the Millennium-Express in Tröpolach. 55 kilometers (34 mi) of hiking trails invite visitors to an idyllic promenade through the snowy winter landscape. Definitely worth the effort and time is the circular trail around Lake Pressegg with a wonderful view onto the snow-covered lake and the surrounding winter wonderland. Another great hike for stunning panoramas is provided at the Nassfeld circular hike. The latter leads from the Sonnenalpe Nassfeld via the Tressdorfer Alm until you reach the border of Nassfeld and back again. Lake Pressegg is also perfect for ice skating. There is a 2.5 kilometers (1.5 mi) long track as well as specially prepared areas for curling and playing hockey. You'll find the entrance at the outdoor pool Hermagor. For toboggan fans the vacation destination Nassfeld-Pressegger See offers four great tracks! Three of those are illuminated for sledding fun at night! The two kilometers (1.2 mi) long Rattendorf toboggan track leads to the Rattendorfer Almweg. The sledding trail Guggenberg starts in Untermöschach and continues for two kilometers (1.2 mi) all the way to the mountain Guggenberg. 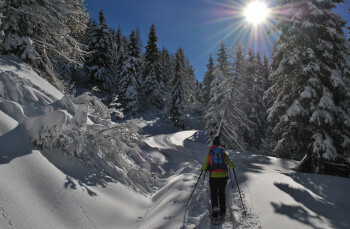 Guided snow shoes hikes start Tuesdays and Thursdays at the hotel Schlössl Lerchenhof. You are able to choose between four different tours with various lengths and differing levels of difficulty to fit your needs perfectly. Après Ski from dusk till dawn is standard for the Bärenhütte or the Yeti umbrella bar at the base station of the Millennium-Express in Tröpolach. Other than that you'll find plenty of places to party it up in the community of Hermagor for example at the Walasco Resident Club in the Bahnhofstraße street. The Gailtal valley has lots of wonderful regional delicacies to offer – especially famous are the Gailtaler bacon and the Gailtaler Almkäse (cheese). Definitely try the native organic salmon or the hefty meat of the Kärtner Oxen. The region is famous for these special treats and they are a must to try when visiting! Award-winning gourmet chef Sissy Sonnleitner conjures up unbelievable specialties from the famous Carnic cuisine as well as delicacies originating in the Alps-to-Adriatic region. The fun and flavorful mix has a gourmet's heart beating faster. The restaurant Sonnleitner is definitely worth a stop! Because of the direct border to Italy you can also enjoy Mediterranean delicacies such as San-Daniele ham. You also have the opportunity to taste precious wines straight from the Gorizia Hills! At the restaurant Da Livio you enjoy typical Cucina Italiana! If you're traveling from Austria take the A2 Südautobahn (south) till you reach the exit Hermagor/Gailtal. From here continue in the direction of Hermagor and Kötschach-Mauthen. At the intersection Nassfeld turn onto the Nassfeld Bundesstraße (federal road) until you reach Nassfeld. Another alternative could be taking the A 10 highway until you reach the motorway junction Villach. Then continue on the A2 Südautobahn (south highway) in the direction of Italy. Exit at Hermagor/Gailtal. See above for how to continue on from there. Coming from Italy take the highway until you reach Udine. Continue your way in the direction of Austria until you reach the exit Pontebba. Drive through Pontebba traversing the Italian mountain pass road in the direction of Nassfeld (Passo di Pramollo). Tom Allen,on 2008. 1. 24. The last evening before leaving, we wanted to enjoy the Austrian wine and coffee at the fire place, but the owner said to the staff that only guest may use the hotel restaurant.So I wonder, if we are white enough for this Austrian hotel, or golden VISA cards were not enough for Austrian village hotel lady owner. I expect that the the hotel management does not know about the economy crises and does not want the guests to spend money and mainly come back again.